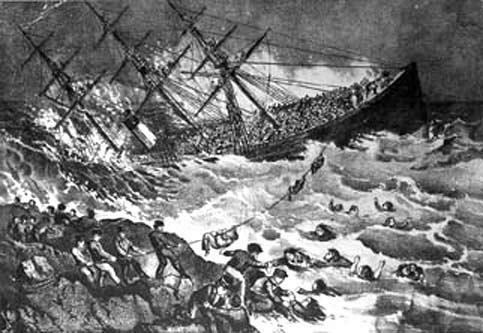 The 420-foot-long White Star Line steamer Atlantic was in its second year of service on one of the early trans-Atlantic runs between Liverpool and New York when it slammed into a rock in stormy weather off Nova Scotia on April Fool’s Day, 1873, taking 545 souls to their death. The Atlantic was a fine new ship, with an iron hull, and operated by what was to become one of the best known steamship lines in the world. She was under the command of Capt. James A. Williams, a man who carried credentials of not only a fine seaman, but the competency of extra master. Three of the four mates also were certified as masters and were qualified to command vessels of their own. Yet under the guidance of these men, this fine steamship, with 957 people on board, was driven head-on at full speed into the Nova Scotia coast at about 3 a.m. The vessel struck a boulder 50 yards off Meagher’s Island. On impact the ship quickly heeled hard to port, allowing the seas to wash away the lifeboats on the exposed side of the wreck and making it impossible for the crew to launch the lifeboats on the port side. There was instant chaos on the decks. Both passengers and crew members rushed to the open decks where high seas swept many to their death. Those caught in their sleep below deck drowned without any chance of escaping. Some sailors managed to swim the 50 yards to the rocky shore, bringing ropes so a form of breaches buoy could be established. Other crew members and passengers climbed into the open rigging as the stern of the ship settled and hung there until they were either rescued the following day, or perished from exposure. When word of the disaster spread to the residents of the area, a battery of small boats and fishing vessels came to the aid of those that were still among the living. And by the following day, the government steamer Lady Head, the Cunard steamer Delta, and the steam tug Goliath also were standing by to offer help. The wreck, however, was in such a dangerous place no large vessel could draw close. So how could a crew, headed by such competent masters as those aboard the Atlantic, have allowed their ship to race directly into peril? There were some government officials who certainly wanted to know, and Captain Williams and his mates were order to tell their story. Williams said the steamer battled stormy weather during its entire trip westward across the Atlantic and could not make much speed. On March 31, after 11 days at sea, the chief engineer reported only 127 tons of coal left in the fuel bunkers and the Atlantic was still 460 miles east of Sandy Hook. With the wind still hammering at the vessel from the west, and the barometer falling, the captain decided to change course for Halifax. While it might be argued that the crew was entering unfamiliar waters, it was noted that these waters were well charted in 1873 and there was no excuse for what happened the next morning. Captain Williams guessed his position at 48 miles from shore. He ordered the ship to steam directly toward shore and to wake him at 3 a.m.
As it turned out, the Atlantic was much closer to land than Williams realized.